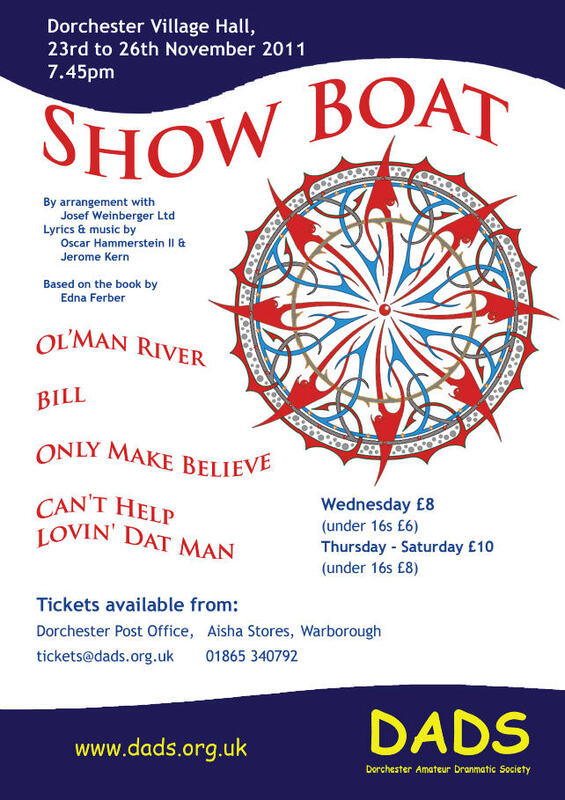 The DADS production of Show Boat was a great success with all the feel of a big theatre production albeit squeezed into the Village Hall. It had a great set and costumes, great music and of course the songs that stay in the memory. There were a number of excellent individual performances which shone through the overall very good production. Show Boat tells the story of the characters working and living on the Cotton Blossom, a Mississippi River show boat, from 1887 to 1901. It is not just a musical; it is a play with the story of a powerful tragic love story with strong themes of racial prejudice, leavened with great songs and sprinkled with humour. The score is by Jerome Kern and the lyrics by Oscar Hammerstein II. DADS has been able to perform this musical because of the arrival of a new musical director, Russell Leigh who is the new headteacher at St. Birinus School. A powerful theme running through the performance were the excellent renditions of Ol’ Man River by John Cornelius as the lead in the black chorus. Show Boat has two choruses, a black one and a white one. Hammerstein uses the black chorus essentially as a Greek chorus providing clear commentary on the proceedings, whereas the white chorus sings of the not quite so real. The DADS interpretation achieved this differentiation very well. The coloured folk are capable of seeing and feeling more than some of the, at times frivolous, white folk around them. Joe (John Cornelius) and Queenie (Vera Hull) captured this perfectly. Candy (Rosemary Mills) led the largely female white chorus with great assurance which held the collective acting together. Much of the humour is provided by Capn’ Andy (Mark Wilkin), his wife Parthy (Sue Kitson), and the aspiring actors Ellie May (Lucie Hall) and Frank Shultz (Johnny Cornelius). Mark delivered his usual energetic and consistent performance and Sue was a truly believable hard-put-upon wife. Lucie and Johnny were a good comedy partnership. It should be noted that in Scene 4 in the Cotton Blossom Theatre, just as Pippa Middleton’s bottom stole the scene at the royal wedding, the appearance of Ellie May’s legs diverted all attention from anything else in that scene. Polly Ann Dow gave a great performance in the part of an eighteen year old girl, Magnolia, in love for the first time. She combined innocence and vulnerability as she succumbed to Gaylord Ravenal’s charms. The latter played by Barry Gibney was truly a leading man who could both sing and act and charm any lady present. There was a believable chemistry between these two on the stage which carried the love story throughout. It would be good to see a lot more of both of them in future productions. Rachel Winslet, as the tragic heroine, Julie La Verne, delivered some of the key songs of the musical with great assurance. She has a presence on the stage which emanates star quality. She had to differentiate the three personas of Julie La Verne; herself, an actress on the Cotton Blossom, and a drunk at the Trocadero, and she achieved this splendidly. Finally one cannot overlook the two cameo roles performed by the two youngest actresses of the play. Jessica Hull played Kim aged 5 and Mollie Hull played Kim aged 12, and both were scene stealers. In particular the scene where Gaylord has to say goodbye to his 5 year old daughter was very moving and caused quite a few matronly sighs and sobs in the audience (and not just from the women). Of course actors need a stage to act upon, and the set design and painting of Michael Herbert and Adrian Brooks and their respective teams provided the perfect backdrop. In particular the painting of the river boat in the background provided real depth to the overall river scene and the interior of the Trocadero was suitably decadent. Congratulations are also due to Rosemary Mills, who was in charge of costumes, for creating a real period piece. So under the confident production of Richard Winslet and the assured directorship of Terry Chipperfield (and the musical directorship of Russell Leigh) this was an excellent production which was enthusiastically received by the audience, and all the cast and production team should be proud of what they achieved in providing first class entertainment.